After a spring and summer of outdoor activity, autumn is the ideal time to schedule house washing. An experienced pressure washing service will clean your house’s exterior to remove contaminants and keep your home and outdoor spaces looking their best. Dacey's Power Cleaning in Puyallup, WA, explains below some of the most popular services they offer to help you ready everything for winter. Over the course of a year, the siding of your house can accumulate a lot of dirt, debris, and water stains. A thorough house washing removes the gray tinge and makes your home look brighter, which immediately improves its curb appeal. Moss, algae, and lichen grow on your roof after rain and feed off the organic materials of your shingles. Worse, they can eat through the shingles and start consuming your roof deck, resulting in wood rot and the need for expensive repairs. Regular gentle pressure washing can remove these organisms and extend the lifespan of your roof. House washing extends to your outdoor furniture and grill, too. These items spend all summer outdoors and accumulate mud, dust, spider webs, and algae. 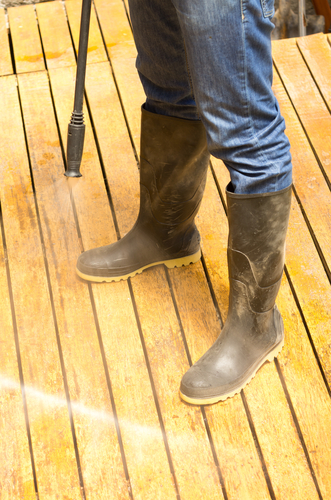 Before storing them for the winter, clean them quickly with pressure washing. This removes caked on dirt and grime, so your pieces will be ready for use when the weather warms up. Algae and mold form on the surface of decks and patios, and it results in a slippery, unattractive, greenish stain. Additionally, leaves and other fall debris can break down and stain wooden or concrete surfaces. Keep your deck or patio safer and more beautiful by having them professionally washed every fall. The driveway accumulates oil stains, tire scuffs, and other eyesores. Since it's one of the first features visitors see, have your driveway pressure washed as needed to remove the stains. There are many pressure washing jobs you can have done to prepare your house and outdoor spaces for winter. For assistance, contact Dacey's Power Cleaning, the premier house washing service in Pierce County. They'll clean your siding, the roof, the deck surface and patio furniture, even your driveway and make everything gleam. Visit their website to request a quote, and call (253) 335-0539 to schedule a consultation.